At $129, the Plugable UD-CAM dock is more expensive than we’d expect, but you’re paying for product that can deliver 85W of power, comes with a VESA mount and has a power button. We just wished it had far more ports than just seven (excluding the Type-C power delivery port). Docking stations are all the rage thanks to the growing popularity of USB-C and Thunderbolt 3 connectors, which allow your ultra-slim laptop to be powered by a dock and communicate with a host of peripherals at the same time. It also makes sense that both connectors are expected to be merged in the soon-to-come USB4 specification. With that in mind, Plugable sent over its UD-CAM docking station for a quick spin. Launched at CES in 2018, it improves on the UD-CA1 (which was released in 2016) by adding some features that were missing. What separates this dock from the competition is that it is cheaper – $129 at Amazon – and much smaller, while offering power delivery. Note: Startech sells the same device for $149 under the model number DK30CHDPD. The UD-CAM looks like a mini PC from afar – it is square with rounded corners and barely thicker than a closed laptop, featuring a no-frills plastic case. At 95 x 89 x 32mm, it is small enough to be left on a desk without taking up much space. Alternatively, it can be hidden behind a monitor thanks to a bundled universal VESA mount. When does a docking station make sense? A docking station is a good idea when you want to plug in a number of peripherals at the same time, but you don’t have enough available ports, or you don’t want the hassle of swapping out cables – or indeed if you want a tidier workspace. However, ubiquitous wireless connectivity (Wi-Fi and Bluetooth) makes these solutions slightly less compelling for those whose needs do not tick the above boxes. This dock comes with a massive power supply unit that weighs far more than the device itself. The PSU weighs 404g and the UD-CAM tips the scales at only 178g. You will need the 100W PSU in order to get the docking station to work; there’s no “passive” mode yet. There’s a power button on the front with a USB 3.0 port (supporting fast charge) and an audio combo TRRS connector. The back plays host to three USB 3.0 ports, an HDMI connector, a Gigabit Ethernet port (powered by a Realtek RTL8153 chip), a USB-C port with 85W power delivery, and the proprietary power connector. There are no card readers or legacy ports here. The UD-CAM comes with a 1m USB-C to USB-C cable and a quick start guide as well. There’s no better way to illustrate the state of confusion currently afflicting the world of wired connectivity than the chart that Plugable has made for users to check the compatibility of host systems when it comes to USB-C video output (otherwise known as Alt mode or USB-C alternate mode) and power delivery (i.e. charging through USB Type-C). The best way to ensure that your laptop is compatible with the UD-CAM (or indeed any other docking station that offers Alt-mode and power delivery) is to email the support team before committing to a purchase. Note that the dock supports MacBook laptops and Chromebooks (though not all of them). Linux is not officially supported, although we’d be surprised if it didn’t work. Where this docking station differentiates itself from other cheaper models is its ability to deliver 85W to drive all but the most power-hungry laptops out there. Both Apple’s MacBook Pro 15-inch and Dell’s XPS 15 should work without any hiccups, as did our test laptop. Docking stations are a high-margin product range which explains why everyone – including laptop vendors – has flooded the market with scores of devices, which may or may not be directly comparable. The IOGear GUD3C05 USB-C docking station has power delivery but uses the power supply unit of the host to deliver it – not ideal if you are planning to have a fixed docking station setup. Where this alternative shines is in its smart design and plethora of ports (including a couple of legacy ones); but expect to pay a premium for that. If your power delivery needs are much lower, then consider the Startech DK30CMHDPPDA. 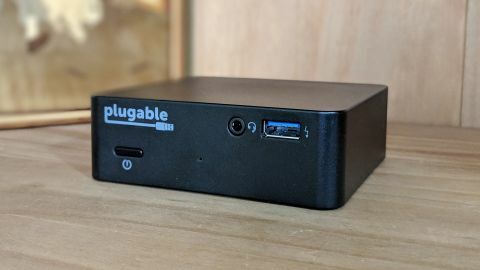 At $73, it is far cheaper than the UD-CAM, and even if it doesn’t have a power button or an 85W power rating, it has far more ports than Plugable’s dock – and it supports DisplayPort and HDMI. If you own an older laptop that doesn’t do power delivery, or if you have older displays you want to recycle with DVI connectors, then consider the UD-3900 from Plugable. At $89, it is relatively affordable and is even compatible with Windows XP. However, given that it depends on DisplayLink, it is not supported by Mac, Linux and Android operating systems. If you don’t need 85W of power to drive your laptop and its peripherals, then the UD-CAM makes little sense. There are cheaper models out there with far more ports than Plugable, and with a longer warranty (the UD-CAM has a 12-month warranty). However, for the rest, the $129 UD-CAM is a solid choice, especially if you don’t have a lot of peripherals to connect and rarely plug in memory cards. We didn’t experience any hiccups during our short time with the device, although naturally enough, your mileage might vary. Nudge the firm’s customer support during the pre-sales process to make sure that your product is compatible, and post-sales if you encounter any issues.